Many men who are diagnosed with prostate cancer, or are managing the disease, experience some level of anxiety and/or depression. Caregivers may also be affected. The psychosocial challenges surrounding treatment choices and side effect management can have a negative impact on the prostate cancer journey. Anxiety and depression aren’t always effectively treated, in part because the symptoms may not be recognized. We encourage you to visit the new Us TOO web page for information on recognizing and managing anxiety, depression and prostate cancer. CLICK HERE to read the article from Us TOO, Anxiety, Depression, and Prostate Cancer . 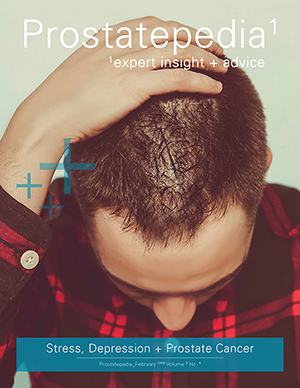 CLICK HERE for the entire February issue of Prostatepedia. To subscribe to Prostatepedia, CLICK HERE .